Eleaf iCare 2 Product Introduction:The iCare 2 features an exquisite rubber paint finish, givin..
VaptioC-FLAT Pod Kit - MSRP $34.95 The Vaptio C-Flat pod kit is an all-..
Smok TFV8 X-BABY - Replacement Glass Tube (3pcs/Pack)*3pcs Per PackSpecifications:Pyrex GlassSmok TF..
X Baby - M2 coils (3pcs/pack) for Smok TFV8 X-Baby *3pc per packcompatible with 3.7V mecha..
7 DazeGrape Reds - 60ml7 Daze introduces Reds Grape, a refreshing grape apple juice perfect fo..
7 DazeICE Grape Reds - 60ml7 Daze introduces Reds Grape Iced, a chilled refreshing iced g..
Vapetasia Pineapple Express 100mlA relaxed tropical blend with the taste of a big ripe juicy pineapp..
Vapetasia Royalty II 100mlComplex combination of velvety vanilla custard, nuts, and light earthy&nbs..
SMOK T-PRIV 220W KITThe SMOK T-PRIV kit takes the successes of the Alien 220W kit and places them in..
Eleaf iCare SoloProduct Introduction:Tiny yet cute looking, the iCare Solo is a new starter kit with..
Vivakita Fusion 50W Kit*from the manufacturer of VAPTIOFusion applied with built in child lock atomi.. Attitude 80W Starter Kit - Easy Vaping!Attitude Kit by Vaporesso perfectly demonstrates our attitude..
Vaporesso - Drizzle Vape Kit!Bringing You The Best MTL Vaping KitThe Drizzle Vape Kit is sleek, mode..
Infeeling 900mAh Variable Voltage with CE4 Tank Starter Kit1pc eGo-Variable V 900mAh&n..
One kit contents: 1*VT200 body 1* USB Cable 1*User Manual 1*Warranty Card 1*Gift Box Packaging .. The Hcigar VT40 is a high quality box mod which is ergonomically designed using the "C-Frame" design.. Aspire Nautilus XThe Nautilus X represents the peak of the Aspire atomizer development curve. Specia.. Horizon Arco Sub-Ohm TankNew Flax Paper and Cotton Atomizer HeadRevolutionary Flax Paper Coil Heads!.. Sense Blazer 200 Sub Ohm Tank Compatible with SMOK's TFV8 Cloud Beast Platform.Product Features:26mm..
ROTK Aoklly T3 tankThis tank is revolutionary top refilled 2ML capacity new tank.Fully compatible wi.. Introducing The Mini Super Sub-Ohm Tank by TOBECO. This is a miniaturized auxiliary tank s..
Laisimo - Snow Wolf Mini Plus MR5 TankIncludes:1x Mr5 Tanks1x 0.25ohm SS316 (10-80W)1x 0.15ohm Ni 20..
Kanger CLTank 2.0Contents1 x Kanger CL Tank 2.01 x CLOCC (SUS316L) 0.5ohm1 x CLOCC (Ni200) 0.15ohm1 ..
Kanger CLTank 4.0CLTANK 4.0 comes with the new CLOCC which use stainless steel and nickel as r..
Kanger Protank-4 Kangertech Protank 4 Evolved Clearomizer​ is the latest cartomizer from Kanger..
Anyvape Furytank 2 Top Filled Airflow Tank*Compatible with Atlantis CoilsFurytank 2 is a brand new s..
Hanny RDA by Blitz EnterprisesClearance, No refund, No exchange, No return!Dual and Single adjustabl..
Hannhya RDA Accesory Kit Clearance, No refund, No exchange, No return!Kit Includes: ..
100% AUTHENTIC HANNYA RTA BY BLITZ ENTERPRISESClearance, No refund, No exchange, No return!.. Horizon Arco Coils 0.2ohm A4 - (3pcs/box)New Flax Paper and Cotton Atomizer HeadThis coils is compat..
*Compatible with: iCare SoloiCare 110iCare 140iCareiCare MiniEleaf - IC 1.1ohm Head Coil*5pcs/PackIC..
SMOK TFV8 Baby-M2 Coil for baby tank on for Q-box Kit : 0.25ohmfor Stick V8: 0.15ohm and ..
Smok TFV8 Baby - Q2 (5pcs/pack)V8 Baby Q2 CoreBrings you deep rich cloud taste 0.4ohm and 0.6ohm dua..
Smok TFV8 Baby Coil - T8 (5pcs/pack)Brings you deep rich cloud taste 0.15ohm octuple coils500-110W /..
Smok TFV8 (V8-Q4) Quadruple Coils*3pc per packBrings you smooth and silky cloud tastePatented Quadru..
Smok TFV8 (V8-T6) Sextuple CoilsBrings you deep and rich cloud taste Patented Sextuple Coil Des..
Smok TFV8 (V8-T8) Octuple Coils*3pc per packBrings you deep and rich cloud taste Patented Octup.. Replacement coils for the Vaptio P-10.2 ohm5 pieces / Pack.. ASPIRE BVC REPLACEMENT COILS This is not for Nautilus tankAspire has truly outdone themselv.. Aspire Cleito 120 Coils 0.16ohm Coils*Sold at 5pcs/PackWhile Cleito 120 is rated at 120 watts, it ca..
Eleaf HW1 HW2 Coils Head *for Pico 25 / Ello tankEleaf engineered new HW series coils. Consiste..
Efan IMR 26650 5500mah 60A 3.7V battery*Price shown is for one battery only. (1pcs)Below are some i..
eGO 650mah BatteryInstructions :When the battery LED light keeps flashing, it indicated y..
Kamry 18350 BatteryBelow are some important safety cautions for Vapes :If using a mechanical m.. Battery for Genesys DNA 200 Battery : Lipo battery 3 x 1500mAh*Below are some important safety cauti..
Efest PRO C2 Smart ChargerDual Bay Lithium Ion Smart ChargerReady to handle all of your Li-ion charg..
USB Charger - for eGo battery..
Niteore Car adapterMake an already great charger better by making it mobile. The Nitecore 12V DC C.. Flash Dry Herb - Extra ChamberSelect either for:HerbWax..
1420A Oil Tank (0.5ml)Liquid flow hole: 2x 1.5mmDesigned for Thick Oil. Premium Oil Tank Lates..
2420A Oil TankLiquid flow hole: 0.75mm x4*Designed for Thick OilFeatures:Traditional kanthal coil0.4..
Kanboro Tech 510 Nail Pro (Black)100% Original wax 510 nail pro510 Nail Pro is an atomizer kit, desi.. Product Features:Newest Model - Version 2.0 More Compact Design Improved Heating Chamber .. Product Specifications :-Chamber size: 7.0mm-Resistance: 0.6-0.8ohm-Working Voltage: 3.7..
Glass Globe Heating Coils (Wax-T) for Wax Oil and ConcentratesModels:Metal Without Screen Heating Co.. Replacement Tube & Driptip Set Resin - TFV12Colorful epoxy resin replacement tube with drip tip .. Replacement Tube & Driptip Set Resin - TFV8Colorful epoxy resin replacement tube with drip tip f.. Replacement Tube & Driptip Set - TFV8 BABYColorful epoxy resin replacement tube with drip tip fo..
3 Connector USB Cable with 8-Pin Lightning, 30-Pin Dock and Micro USB Connector Charging and Sy..
Dual Function USB Cable - High Quality. 2 in 1 for both USB Data transfer and Charging.Choose from colors : Silver with cord that has .. Horizon Duos Replacement Glass Tube (1pc)Available in various colors, so you can change out the glas..
Drip Tips C120 - Snake Skin (for Cleito 120)Epoxy ResinSnake Skin Deisgnfor Cleito 120..
Silicone Test Drip Tip.Fits most of the subohm tanks*100 (individualy pack) pcs pe..
Smok Authentic O-rings ForTFV12TFV8TFV8 Big BabyTFV8 Baby..
Vapetasia Killer Kustard 100mlAn enchanting mix of vanilla and custard, reaching a perfect har..
Vapetasia Strawberry Killer Kustard 100mlRich and creamy clouds of vanilla custard combine with hint.. Bomb Bombz GOD'S GIFT - 100mlA very smooth and refreshing flavor of a strawberry kiwi smoothie with .. Bomb Bombz GREEN CRACK - 100mlA smooth flavor of candy apple that makes you think you're eating a lo..
Forgotten Flavor Apricot Gummy - 60ml..
Forgotten Flavor Ruby Cherry Gummy - 60ml.. 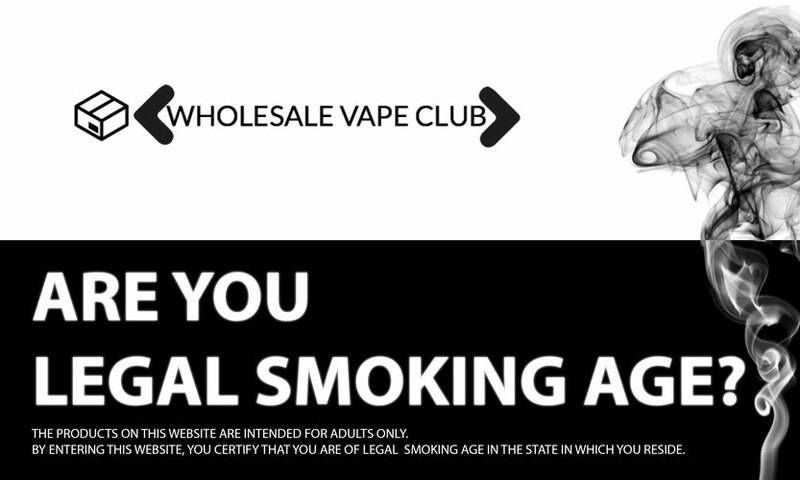 Copyright © 2017, Wholesale Vape Club, All Rights Reserved.